There is a tremendous farmland transition about to take place. Sixty percent of Iowa farmland is owned by people over the age of 65, according to Iowa State University. Thirty-five percent of Iowa farmland is owned by those older than 75 years of age. Farmers who rent land are in a precarious position: When their landlords die, many heirs will want to cash out quickly, leaving farmers struggling or unable to find the financing to purchase land. The situation is equally severe for those who farm with their families. Many farmer landowners plan to divide their land equally among offspring. Their farming offspring may not be able to buy out the other heirs, who may want to sell the farmland to cash in on their inheritance. And these challenges pertain only to the farmland itself. Transferring the farm business can also involve a difficult dance of giving responsibility to the younger generation while the older generation learns to let go. Practical Farmers is here to share stories and resources about the great farm transition that is currently underway. 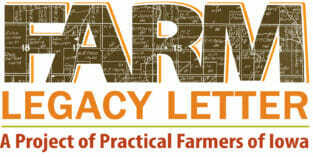 Practical Farmers’ niche is farmers teaching other farmers. Many farm families are willing to share their farm business and farmland transfer stories. See the profiles below for those stories. Practical Farmers commissioned playwright Mary Swander to write this play about the many issues surrounding farmland transfer. The play presents a number of ways farmland owners have planned for – or failed to plan for – farmland transition. Click here to see the latest performances! To bring the play to a location near you, contact Mary Swander. Too often, farmland owners have not decided and then communicated what they want most for their farmland when they are gone. Over the next several years, Practical Farmers will be helping. 1). To recognize those PFI farmland owner members who work to sustain farm businesses, long-term soil productivity, environmental quality and vibrant rural communities, including helping the next generation start farming. 2). To call attention to the need for greater landowner partnerships with farmers. Any non-operator landowner – which is someone who owns land but does not labor on that land – is eligible. Need a farm transfer attorney? SHOULD IN-LAWS BE INVITED TO FAMILY FARM MEETINGS? If you have questions or concerns regarding farm transfer: email Greg Padget at greg@practicalfarmers.org.